The contribution of CXCR7 to the tumor microenvironment has introduced a new level of complexity to CXCL12 signaling in breast cancer. In the previous issue of Breast Cancer Research, Hernandez and colleagues delineate the roles of CXCR4 and CXCR7 in tumor invasion and metastasis. The authors demonstrate that co-expression of CXCR7 and CXCR4 results in inhibition of CXCL12-mediated invasion, reduced intravasation of tumor cells into the vasculature, and fewer lung metastases compared with parental tumors. 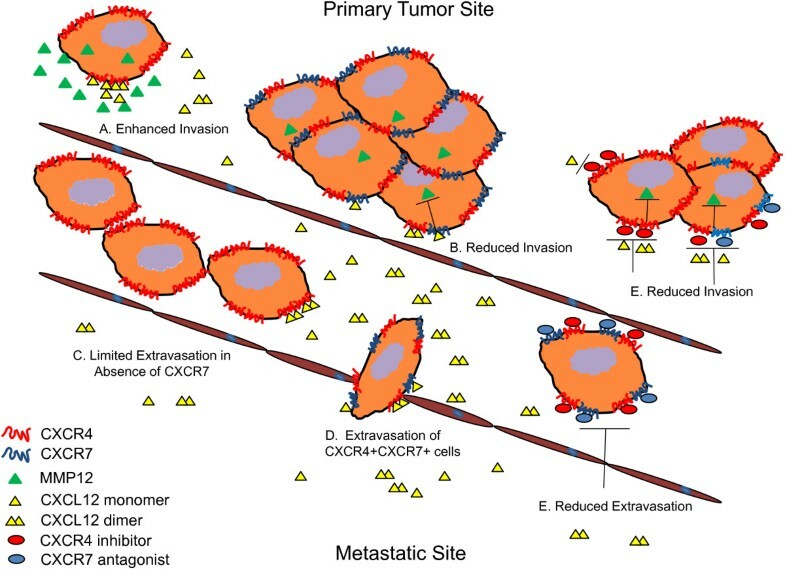 The results of this study suggest the combination of small molecule inhibitors of CXCR4 and CXCR7 could dramatically reduce invasion, intravasation, and metastasis and could be highly beneficial for the treatment of invasive breast cancer. The significance of CXCL12/CXCR4 signaling in breast cancer invasion and metastasis is widely appreciated. Recently, the contribution of the CXCL12 orphan receptor CXCR7 to the tumor environment has introduced a new level of complexity within the realm of chemokine/chemokine receptor signaling. Hernandez and colleagues have attempted to lift the veil and dissect the individual contributions of CXCR4 and CXCR7 to tumor invasion and metastasis. First, the authors demonstrate the potentiation of in vitro CXCL12/CXCR4-mediated chemotaxis by the overexpression of CXCR7 in the MTLn3 JP cell line. The authors suggest this is due to the sequestration of CXCL12 by signaling-deficient CXCR7, which results in maintenance of a steep CXCL12 gradient . Tese results are also consistent with reports that indicate CXCR7 as a sink for monomeric CXCL12, leaving dimeric CXCL12 to bind CXCR4 and mediate signaling preferentially through the recruitment of β-arrestin, thus enhancing chemotaxis [2, 3]. Although the authors do not address the formation of CXCR4/CXCR7 heterodimers by their transductants, it would seem to be a likely occurrence. Such heterodimers have been reported to constitutively recruit β-arrestin in response to CXCL12, potentiating chemotaxis when compared with CXCR4 homodimers or monomers [4, 5]. Next, the authors demonstrate that while overexpression of CXCR4 in MTLn3 JP cells substantially increases invasion, co-expression of CXCR7 results in an inhibition of invasion in response to CXCL12 both in vitro and in vivo. In addition, CXCR7 overexpression reduced intravasation of tumor cells into the vasculature, which is probably due to the reduced ability of these cells to degrade the extracellular matrix. Following an evaluation of expression of matrix metalloproteinases, the authors identify MMP12 as upregulated by CXCL12 ligation of CXCR4 and diminished within the context of CXCR7 co-expression (Figure 1A and 1B) . The authors cite a correlation between CXCR4 and MMP12 mRNA expression from the Oncomine database, but no such correlation with CXCR7 expression. These results are consistent with the observation that Gi-mediated signaling induced by monomeric CXCL12/CXCR4 could result in PKCδ-mediated induction of MMP12 expression , whereas β-arrestin-mediated signaling is preferentially activated over canonical G-protein pathways when CXCR4/CXCR7 heterodimers are expressed . Contribution of CXCR4 and CXCR7 to tumor invasion, intravasation, and metastasis. (A) At the primary tumor site, CXCR4 alone enhances invasion through the extracellular membrane via induction of MMP12 in response to CXCL12. (B) CXCR4+CXCR7+ cells are less invasive in response to CXCL12 due to downregulation of MMP12. (C) According to Zabel and colleagues [7, 8], CXCR4+ cells show somewhat limited transendothelial migration compared with CXCR4+CXCR7+ cells as shown in (D). (E) The combination of a CXCR4 inhibitor and CXCR7 antagonist would reduce invasion, transendothelial migration, and finally metastasis. In agreement with reduced invasion, CXCR7-overexpressing tumors produced significantly fewer lung metastases than the parental MTLn3 JP tumors. The CXCR4-overexpressing tumors produced fewer lung metastases than the parental tumor despite robust invasion and intravasation in vivo. The authors suggest anti-angiogenic properties of MMP12 could suppress seeding of the lung by CXCR4-overexpressing tumor cells . An alternative explanation for this apparent paradox is offered by the research of Zabel and colleagues showing a requirement for CXCL12 binding to CXCR7 in CXCL12-mediated transendothelial migration in vitro (that is, extravasation; Figure 1C and 1D) [7, 8]. The results of the study by Hernandez and colleagues suggest a number of potential therapeutic modalities. The most obvious therapeutic targets currently in development are small molecule inhibitors of CXCR4 and CXCR7. Inhibition of CXCR4 using AMD3100 resulted in reduced chemotaxis and invasion in vitro and in vivo . Antagonism of CXCR7 by compounds, such as CCX771, could reduce extravasation and thus metastasis . Conceivably, the combination of such compounds could dramatically reduce invasion, intravasation, extravasation, and metastasis (Figure 1). Considering breast cancer metastasis is the leading cause of morbidity and mortality, such modalities could be highly beneficial for the treatment of invasive and preinvasive disease.